Luminous and luxurious, white topaz takes this bridal ring set to new heights. The brilliant gemstone features the bright white color favored by brides, but without the steep price. The white topaz gemstone measures 6mm for excellent style and radiance, too. 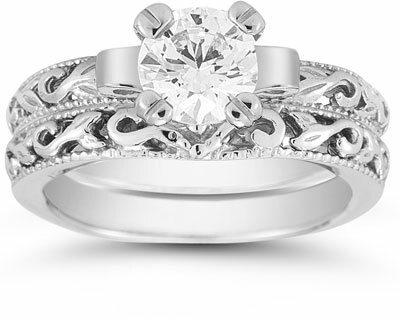 Two bands of sterling silver echo the bright white look for this bridal set, and they feature art deco designs for added appeal. The combination of the beautiful white topaz gem and the gleaming sterling silver bands make for a perfect bridal ring set. 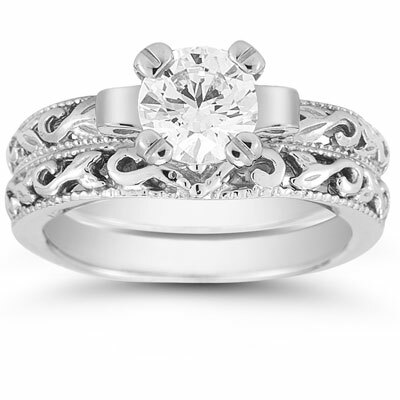 We guarantee our White Topaz 1 Carat Bridal Set in Sterling Silver to be high quality, authentic jewelry, as described above.